Summary: How times have changed. Back when the 1904 Olympic marathon was held, it was part of the World’s Fair in St. Louis. 41 men signed up to participate, but on race day, only 32 showed up. The course washed out several days before the event, so a new course was mapped, much hillier than the original. One of the participants was chased off the road by a dog; another kept stopping for snack breaks along the way; a third struggled when his trainer fed him strychnine mixed with an egg white to keep up his energy. Despite the 90-degree heat, there were only two water stops, and some of the water was contaminated, forcing more than one man to drop out due to stomach issues. One racer jumped into a car for several miles, then tried to pass himself off as the winner by running the last bit of the race. In the end, Thomas Hicks, the American guy who consumed strychnine, managed to stumble across the finish line as the first legitimate winner. 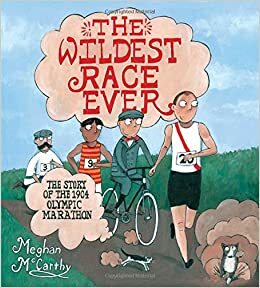 End matter includes additional information about the race and a few of the racers, plus a bibliography. Pros: Lots of laughs reading about a race that resembled “It’s A Mad, Mad, Mad, Mad World”. 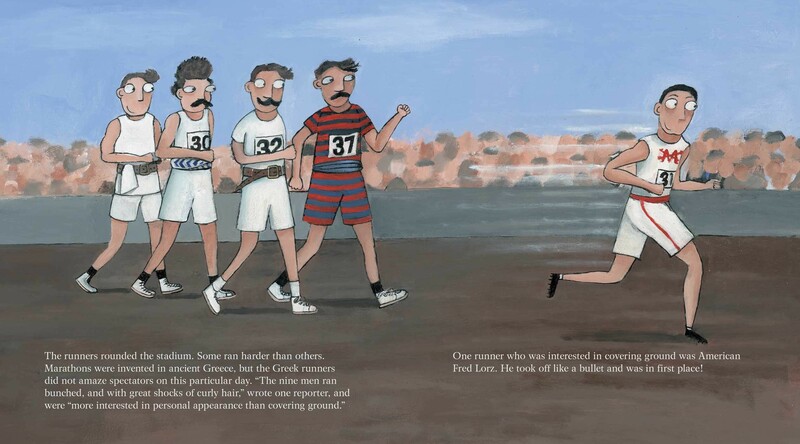 Kids will enjoy comparing and contrasting the 1904 marathon with today’s Olympics. Meghan McCarthy’s pop-eyed cartoon illustrations add a great deal of fun to the story. Cons: The cast of characters was a little large to keep track of in a picture book. I had to keep referring back to a two-page spread at the beginning that profiled the main runners.